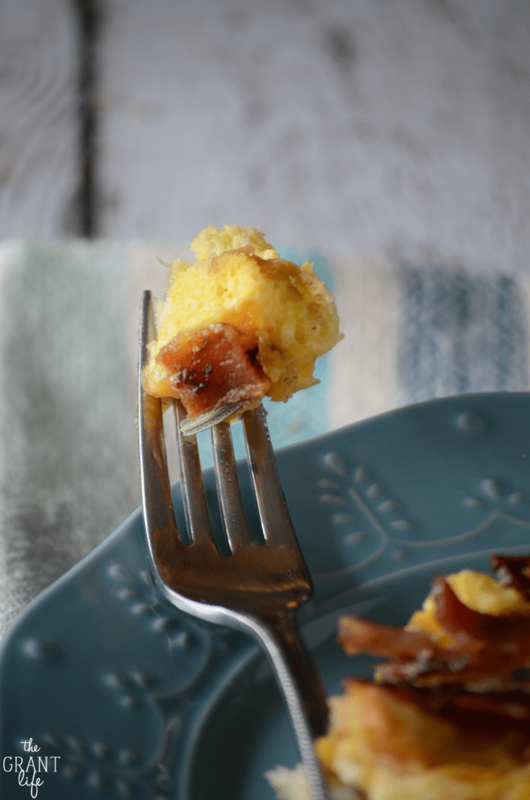 This cheesy bacon breakfast casserole comes together in under 30 minutes and is filled to the brim with cheese and bacon! We had our friends come over this past weekend for dinner. Well, brenner. I made them breakfast for dinner. Which is really the best kind of dinner if you ask me. I made this cheesy bacon breakfast casserole, some super fluffy pancakes with raspberry sauce and cappuccino cream cheese brownies. They asked if they could bring anything I told them nope – I got this. But my bestie brought stuff for mimosas. So there was that too. And I have to confess something – I had never made a breakfast casserole before this weekend. Whaaa?? I know! And holy cow batman, I have been missing out on some super easy and delicious breakfasts. Out of everything I cooked, this casserole was by far the easiest part. You literally toss everything together and bake it. And if you want – you can toss everything together the night before and bake it in the morning. 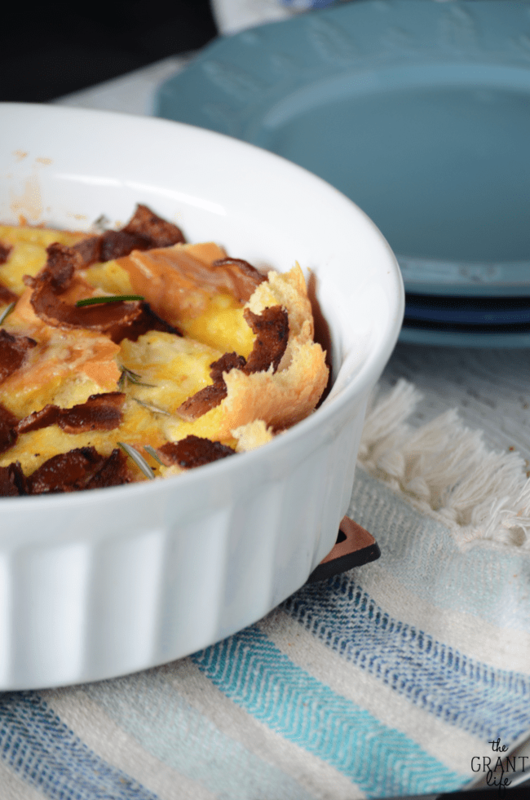 And if you can’t tell – I am totally 100 percent sold on breakfast casseroles. There will be more in our future. 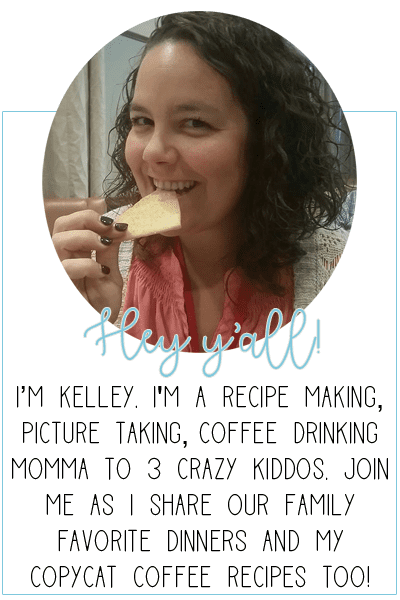 And I have another secret – I had them come over so I could cook a few new recipes for the ole blog. Who does that?! Well, me apparently. I love [love!] creating new recipes but sometimes I have this twinge of guilt because we don’t always eat the whole thing. I don’t like to waste food. Not at all, not even a little bit. I told them of my evil genius plan to have them over solely to cook for them and share recipes with yall, and they were totally ok with that. They told me that I can use them as taste testers anytime. And they better mean that because I will be a-callin’. And out of the 3 new recipes I tried – I think this may have been the biggest hit. It had the least amount left over after everyone left. There was one single serving available and I gladly re-heated it for breakfast. Oh and I should mention I made a double batch of this casserole. Two casserole dishes and only one slice left. And the answer to the question I know you are wanting to ask is yes. Yes it does re-heat perfectly and taste amazing the next day. 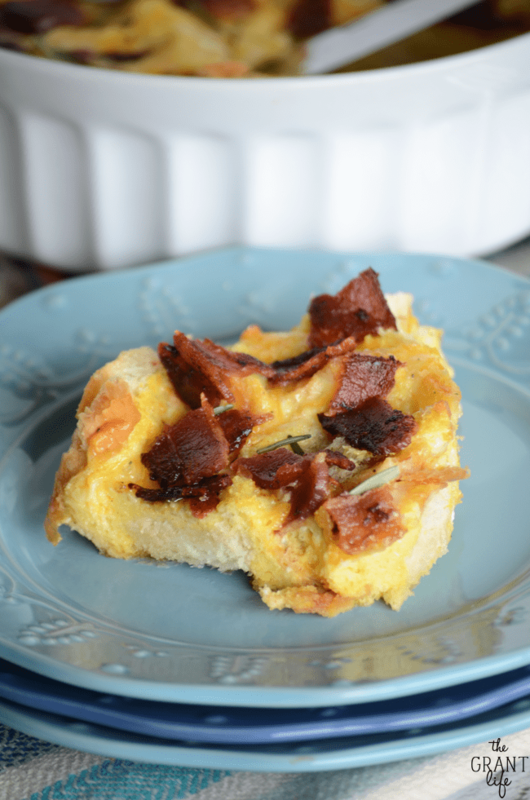 Anyhoo, if you want to give this cheesy bacon breakfast casserole a try – go for it! It was taste tested by some of my best friends of over 15 years. And you know that friends like that do NOT have a problem telling you the truth. 1/2 loaf of French bread, day old works great! Break the bread into cubes and place them in the baking dish. Whisk together the eggs, milk and cheese plus the salt and pepper. Pour over the bread and allow a few minutes to absorb. Add the bacon last. Bake for 25-30 minutes, or until the eggs are set and the bread crisp. Remove, add the fresh herbs and enjoy! And sign up for our recipe updates! I’ll send fresh hot recipes (like this one!) right to your inbox! This looks so good. And since I’m not much of a morning person anymore, the Littles I have put a damper on that lol, breakfast for dinner has quickly became one of my faves. 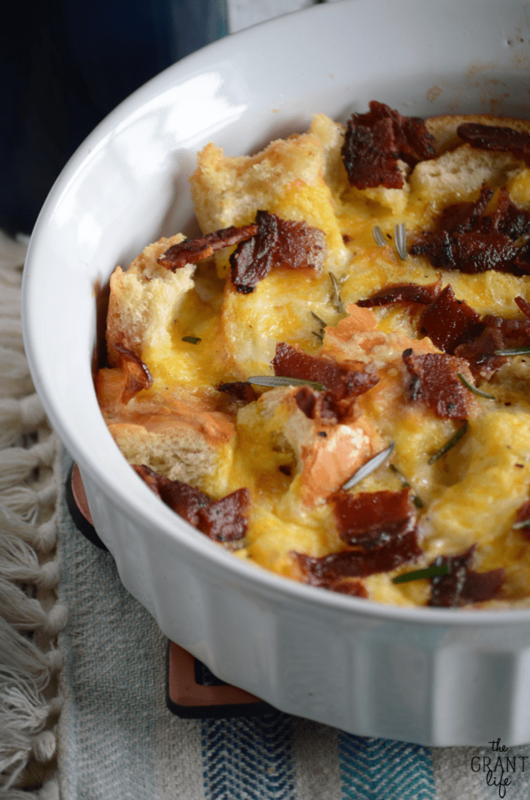 I can’t believe you haven’t made breakfast casseroles before. They are my go-to for Saturday brunches (we like to sleep in on Saturday). I’ll be adding this recipe to mine. My hubby will love this as it involves bacon. Thanks for the recipe!! I made this for breakfast this morning and it was OUTSTANDING! Instead of French bread, I used Tuscan Bouley (similar to sour dough) and used 6 slices of bacon. I didn’t use any fresh herbs. Mine needed to back for about 50 minutes in about a 9×9 baking dish. We truly LOVED this breakfast. Thank you so much! This looks soooo good! I tend to make breakfast for dinner a lot. I don’t feel like making an extravagant breakfast super early in the morning 🙂 Cannot wait to try this! Agree.. sometimes my brenners are more extravagant then regular breakfast. This one is simple yet so tasty! Hope you enjoy Kacey! You had me at “cheesy” this dish looks so good! Brenner is the best, isn’t it!? I won’t lie, I do that quite often! I’m always bringing recipe preparations with me when I go visit friends and family…and my camera. ha ha ha! 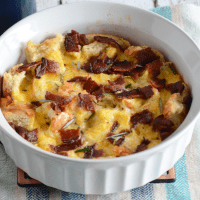 This breakfast casserole sounds fantastic, pure comfort food that I would love to eat at any time of the day. Yes! Glad I’m not alone! My friends are use to it by now.. haha! 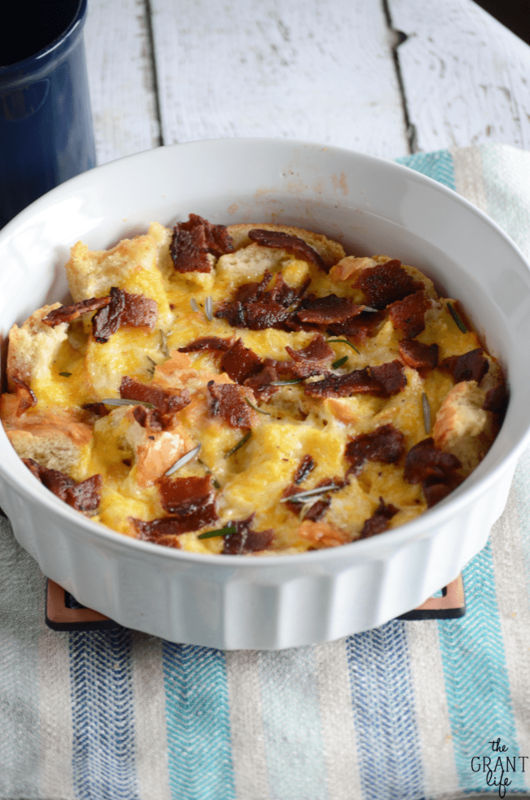 First, this breakfast casserole looks YUM! Perfect for serving to company! Second, I got a good laugh at the end….you’re so right that friends of 15 years have no problem with honesty! Sometimes a little too much – haha!!! Haha! SO SO true! My friends will tell me like it is for sure. I bet this casserole is great and with those mimosas too! Cheese & Bacon = Life complete. LOVE this casserole. I want someone to make it for me for Mother’s Day!! RIGHT?! Nothing better then cheese and bacon! And I need to find more neighbors who want free food..haha! This looks tasty! I have to admit too, I don’t think I’ve ever made a breakfast casserole. I should get on that! Once I thought about it.. I was like whaaa?? I can’t believe I had never made one. But I’m hooked. There will be more in the future for sure! I have been thinking a savory sort of bread pudding would be great. This looks like a winner. Thanks. Thanks Cynthia! Hope you enjoy!